Have you heard about Project Freelance 2017? Project Freelance is a campaign I recently launched that will support free classes on freelance journalism for middle and high school students as well as communities. The classes will occur monthly for one year. I planned a schedule of classes so that students who would not necessarily be offered professional writing classes will be able to learn about career opportunities. The community classes are open to all, even those who may otherwise be unable to afford writing classes. While the classes will take place in a different city each month from now until May 2018, the fundraising aspect of Project Freelance ends at the end of June. I have less than three weeks to fulfill my campaign goal (and I’m 1/3 of the way there!). Make a donation. Every little bit helps, it truly does. And I have great perks – more on them below! Share the campaign on social media. Tell your Facebook friends and Twitter followers about Project Freelance. I’m willing to travel to hold the seminars AND many of the perks are virtually accessible, so contributors need not reside where I am in North Carolina to benefit. Use #projectfreelance2017. Share the campaign with school administrators and parents. I would love connections with schools who are interested in having a visiting writer. I really enjoy presenting at schools and I’m a big advocate of encouraging young writers to move forward with their writing goals. I had my first editorial published when I was 17 – getting published does not have to wait! I spent a lot of time developing perks that I know writers and non-writers would enjoy. First, many of the perks are offered to you or a writer you select. That way non-writers can pass along their perk to their writer friend or family member. I held my first Project Freelance 2017 event last week in Chapel Hill, NC. I shared three of my magazine query letters and the stories behind each article. 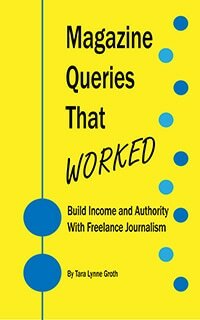 Thanks to campaign contributors, everyone who attended last week gets a free copy of my new book Magazine Queries That Worked. My next event is the Business of Being a Writer on Monday, July 17th at 7PM in Savannah, Georgia (Islands Library on Johnny Mercer Boulevard). Thanks to contributors, this event is fully funded by the campaign and open to all. Query Letter Critique. Send in your query letter for a personalized critique and suggestions on where to send it. Creative Critique. Send in your novel or memoir excerpt, or short story, for a written critique. Poem+Broadside. I’m combining my poetic background and my sketching to produce an original poem with broadside – you keep the original. Write Naked tote bag. These are just too cute. Please take a moment to contribute to the campaign and share it. I greatly appreciate your help in moving this campaign toward its goal! Thank you!